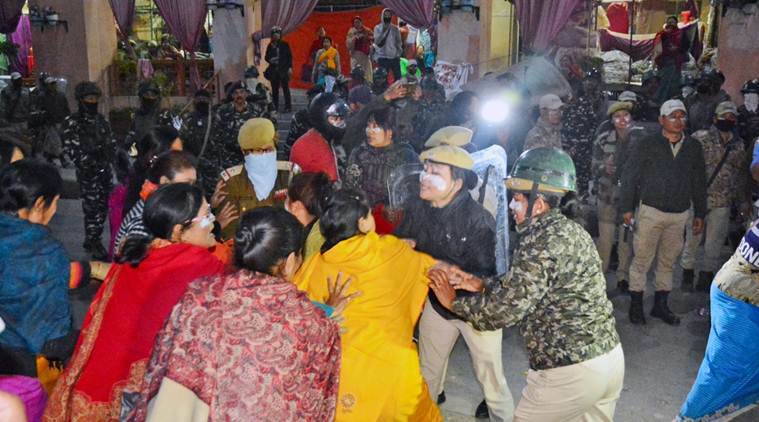 Hundreds of women vendors from the four women’s markets in the Imphal city of Manipur, who staged a sit-in protest in the main market complex from Saturday morning, have refused to go home. The activists said that they shall stay in the market complex until Wednesday when it is expected that the controversial Citizenship (Amendment) Bill, 2016 will be tabled and likely to be passed by the Rajya Sabha. This has become a headache for the police and paramilitary personnel maintaining law and order in the city areas. There are problems in procuring potable water, and even toilets and bathrooms do not have running water. The initial plan was to stage a routine sit-in by the women vendors. But they have decided to stay in the market complex till Wednesday since the Central government is firm on passing the Bill. The activists said that the government should give a written assurance to the effect that the Bill shall not affect the north-eastern region in general and Manipur in particular. Manipur Chief Minister N Biren Singh said that his government is against the bill if a clause is not inserted to safeguard the people. Biren Singh on Saturday said that the government shall continue to oppose the bill ‘unless a clause is inserted’. Opposition Congress has been demanding a special session of the Assembly to take a resolution in this regard. There have been numerous daily protests in other parts of the State. Effigies of Narendra Modi and Rajnath Singh are also burned at many places. Meanwhile, the People’s Alliance Manipur formed by 131 civil society organizations has called for a total shutdown from 5 am on Monday till 5 pm on Tuesday in protest against the citizenship bill.